Hello *hangs head in shame*, it’s been a while hasn’t it? It’s not all bad though as I come with good news, we recently won best casual dining in Limerick at the Irish Restaurant Awards. We were up against some stiff competition and didn’t think we would win in a million years so didn’t even bother going to the award ceremony. We did begin to suspect something though when the organisers rang the day prior to the awards to find out why we weren’t going and would we not send someone to represent us just in case. We sent the “sister in law” with not much expectation so it was a bit of a shock for her too when she had to go on stage and collect our award and get photos taken with the Mayor of Cork. We couldn’t believe it and were thrilled, I had a pain in my jaw from bragging to every person that entered the shop the few days after. We will now represent Limerick at the national awards in Dublin in June and are waiting our visit from the mystery judge in the next couple of weeks, the end result will be 55% judge vote and 45% public vote so I will be on the campaign trail for your text vote during April and May…. So back to the recipe, a very easy and tasty one today, do I do any other? I served this with creamy mash and it was sooooo good, creamy, buttery, fattening, indulgent, YES PLEASE!!! 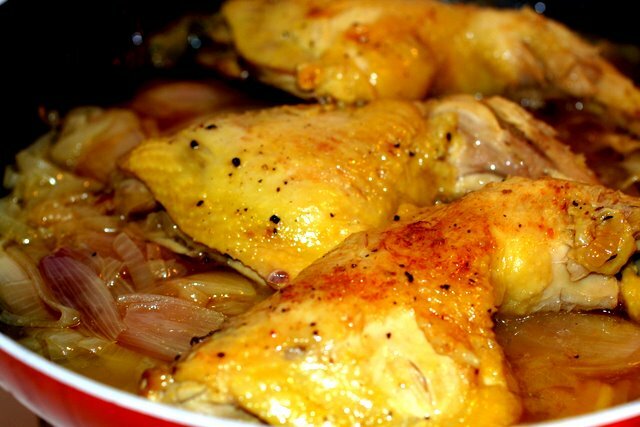 – add the chicken, onions, and cook over a medium heat for about 10 mins stirring occasionally until golden brown all over. – season with salt and pepper, add the thyme, bay leaf and garlic, cover and cook gently for about 30-40 mins until tender and cooked through. 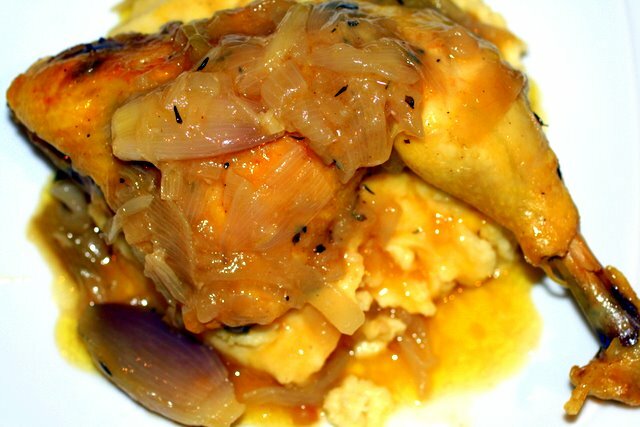 – remove chicken and add wine to your onions and cook for a couple of minutes to let alcohol evaporate, add your flour and stir and add a little stock and cook over a high heat until thickened. 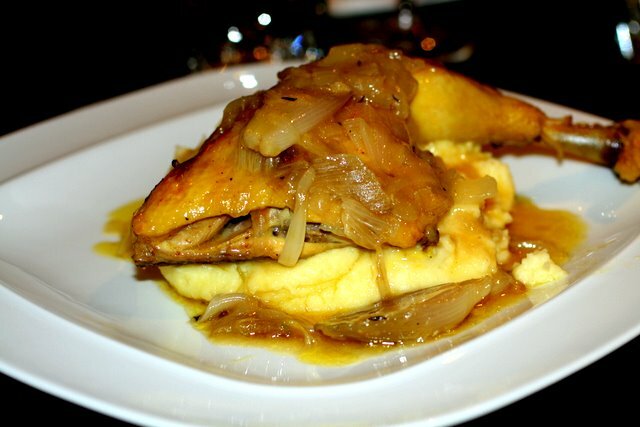 – serve your chicken on your creamy mash and pour your onion gravy over the top. – dig in and enjoy…..
p.s sorry about layout, don’t know what’s wrong or how to fix it??? « Happy St Patrick’s Day Y’all…. Lor, you must be a mind reader…..I just found one lone chicken leg in the freezer and decided to “do something” with it tomorrow since Mike will be off at the match and therefore not at my beck and call to cook something for me!! Sorted!!! Yay! Well done to you. Best of luck at the finals too! And further congratulations are required for this amazing looking chicken-based comfort-fest – YUM.